In a trash-strewn alley (dressed with Metallica and Sepultura posters! Woo! ), the Teenage Mutant Ninja Turtles once again beat the snot out of a horde of Foot Soldiers. Ever since Leo killed the clone Shredder, the Foot Clan has been sloppy and disorganized. Yet somehow their crimes have been increasing steadily, becoming what the media have called the “Ninja Uprising”. The Turtles came back to New York from Northampton to check up on it and have been fighting the pathetic leftovers of the Foot ever since. A unit of four gaudily-clad Foot Soldiers (Croaker, Wen, Gei and Szefchek) manage to escape death or capture and flee into the sewers. Croaker decides that the best place for them to hide is in the Turtles’ old lair, which he claims the Foot Clan drove them out of years ago (suuuure they did). Along the way, Croaker laments that without the Shredder to guide them, the Foot Clan has really been sucking and wishes for a powerful new leader. Upon breaking into the sewer lair, they’re greeted by the rampaging one-eyed Leatherhead. 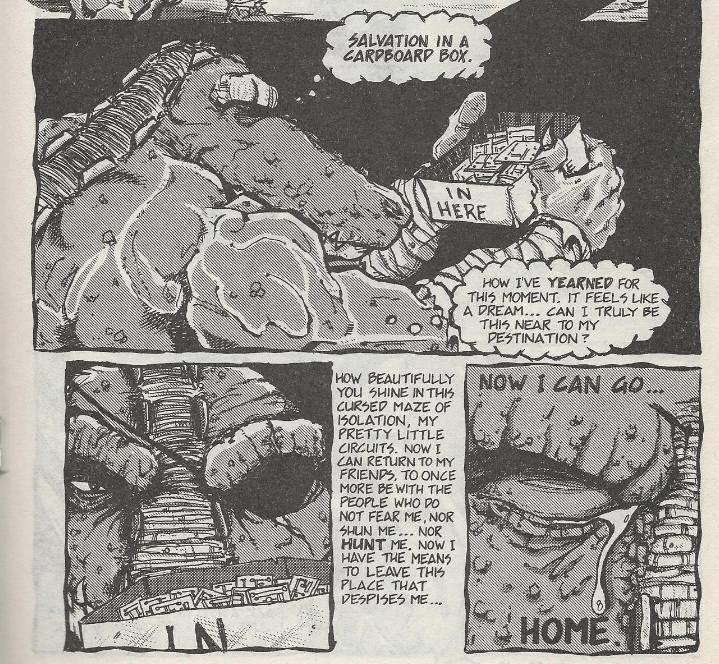 Leatherhead trounces all of them, but Croaker begs for mercy, allowing Leatherhead to regain his composure. Apparently, ever since he moved into the old lair, he has been trying to build a new Transmat so that he can rejoin his friends, the Utroms, on their homeworld. He asks the Foot Soldiers to help him finish his device, as his claws cannot perform the delicate craftsmanship required. Croaker, seeing Leatherhead as a potential new leader, agrees to help. Hours pass and with the work nearly done, Leatherhead leaves to a storage room to get the last components, weeping with joy that he can finally go home. Back up top, the Turtles finish tying up the Foot Soldiers and decide to go crash with Leatherhead at their old pad. Once they arrive, though, they find the Foot Soldiers standing around and prepare to finish them off. Luckily for the Foot Soldiers, Leatherhead bursts in and prevents the fight, explaining the situation to the Turtles. The Turtles agree to help finish the Transmat alongside the reluctant Foot Soldiers and get to work. As they get lost in their work, no one notices Croaker remove a single chip (he wants Leatherhead to stick around and lead the Foot). With the device completed, Leatherhead bids a tearful goodbye and climbs onto the platform. Don flips the switch, but instead of teleporting Leatherhead to the Utrom homeworld, the Transmat just explodes around him. Leatherhead freaks the Hell out and decides that both the Turtles and the Foot Soldiers have betrayed him. He begins wailing on all eight of them, but then decides that he’d rather plot a more gruesome vengeance and runs off, swearing to get even with them some day. 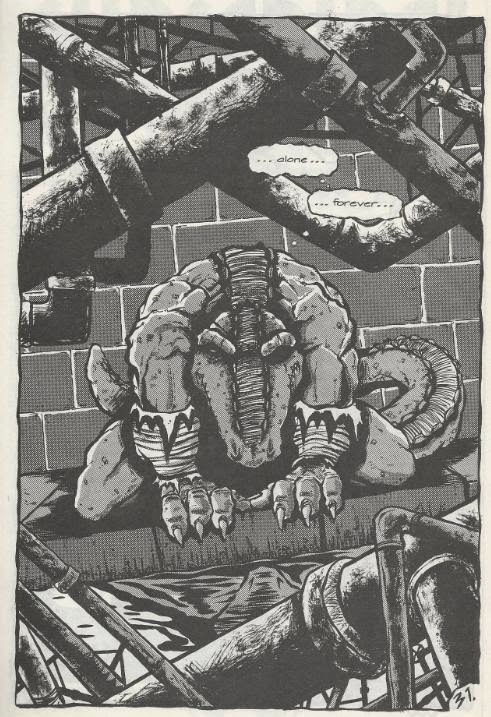 As Leatherhead sulks all alone in the sewers, the Turtles head to a rooftop and remark that although they are alone in the world, they at least have each other. Meanwhile, Leatherhead has no one. 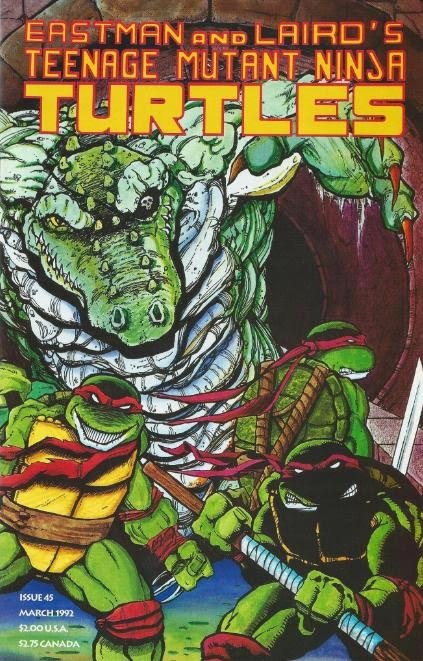 *Chronologically, I would place this story after TMNT (Vol. 1) #21 as it takes place in New York City. The next Laird-approved canon issue will be TMNT (Vol. 1) #28. *Leatherhead's story will continue in Tales of the TMNT (Vol. 2) #8. *A letter at the beginning of this issue from Eastman and Laird establishes that, beginning with this issue, TMNT would be done completely in-house at Mirage, with no more guest artists and writers and no more out of continuity stories. *The opening pages are an homage to TMNT (Vol. 1) #1. *Leo killed the Shredder for the second time in TMNT (Vol. 1) #21. The TMNT have fought the sloppy and disorganized remains of the Foot Clan repeatedly since then, in stories such as “Digital Webbing Presents”, “Challenges: Raphael” and “Kung Fu Theater”. *The “Ninja Uprising” will reach a head in the “City at War” arc, beginning in TMNT (Vol. 1) #50. *One of the Foot Soldiers remarks that the Foot Clan had driven the TMNT from the sewers. That event only occurred within the first TMNT live action film. In the comics, they were initially driven from the sewers by Baxter Stockman’s mousers in TMNT (Vol. 1) #2. *The TMNT last met Leatherhead and gave him the keys to their old sewer lair in Tales of the TMNT (Vol. 1) #6. 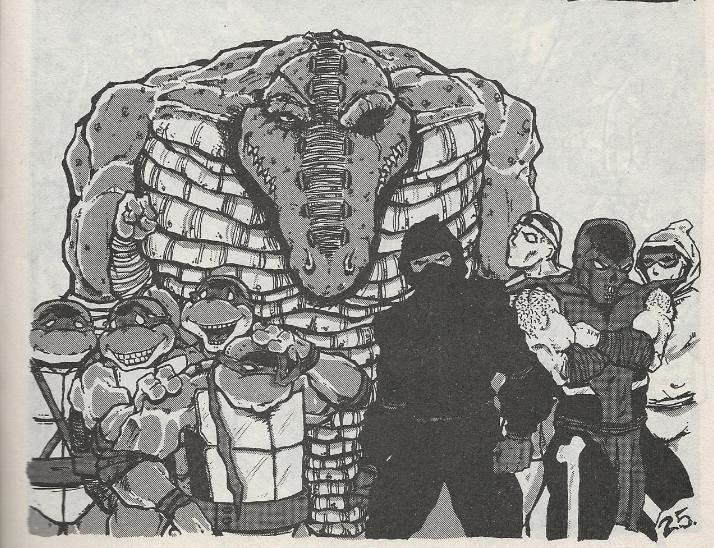 *The full deal on the Foot Soldiers (Croaker, Wen, Gei and Szefchek) will be revealed in Tales of the TMNT (Vol. 2) #34. TMNT (Vol. 1) #45 is an important “milestone” issue in a number of ways. Firstly, as per the letter published on the inside cover, it marks the editorial turning point of the series. No more guest artists and writers, no more goofy out-of-continuity stories, just straight-up gritty ninja action akin to the first couple dozen issues of the series. 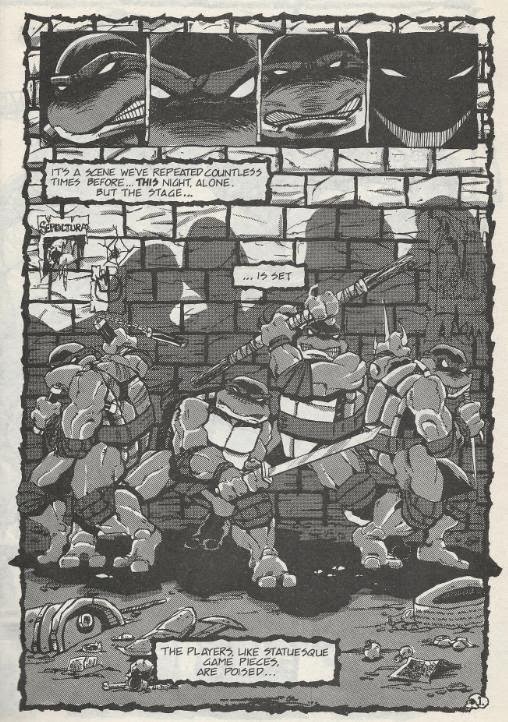 As such, the story begins with a fitting homage to the first three pages of TMNT (Vol. 1) #1. The change was certainly welcomed from me, as I was getting kind of sick of all the really silly non-canon stuff. Don’t get me wrong, a lot of quality stories came out of that era (Michael Zulli’s “Soul’s Winter” trilogy, for instance), but the bad outweighed the good by a wide margin. Even worse, it’s hard to tell just which stories from that era are to be considered canon. Taking things back in-house was a wise move on Mirage’s part. The line:"The freaks used to call this cesspool 'home' before we drove them out. Now it's our only refuge." Refers to the sewers as a whole as being the Turtles' home. It's not specifically referencing their old lair. The "before drove them out" bit refers to the TMNT fleeing NYC to go to Northampton (in issue #10) - not specifically fleeing the lair. Why Croaker and Wen are familiar with the old lair itself could be because they discovered it while Leatherhead wasn't home and they assumed it was abandoned. Very thin, I know - but it's a workaround for those that want one. I don't know if it would win me a no-prize, though. Berger’s art has a bit more of an edge to it than we’re used to from him, almost Talbot-ish, but still looks like his distinctive TMNT daily strip style. Just with scarier teeth. His elements of cartoony humor are still present, with goofy reactions (Leatherhead getting caught in the explosion is anything but serious) and some funny sight gags (as Leatherhead searches for the microchips in his storage room, he finds them in a box labeled “In here”). The result is a bit more bi-polar than his later efforts, but still a fun fusion of the goofier and grittier sides of the Ninja Turtles. Leatherhead’s reaction at the end was a little…abrupt and resolved fairly quickly (“Ah, just let him go. We can’t go after him, anyway. It’s the end of the issue”). Thankfully, the thread eventually got followed up on in Tales of the TMNT (Vol. 2) #8, begining a trilogy of stories spawned from this issue. They read together surprisingly well, even if each issue is separated by a wide gulf of years. Perhaps most importantly, this issue begins building up toward “City at War”, one of the most (and arguably THE most) epic Turtles stories ever published. I’ve remarked on this in my reviews for stories like “Digital Webbing Presents”, but I loved how the Foot Clan were reduced to a disorganized mess following the death of the clone Shredder and were constantly shown being handed embarrassing defeats, often by only a single Turtle. It actually builds toward the inevitable “City at War” arc quite well, where all that Foot stuff comes to a head. All in all, this issue isn’t perfect. There’s a major continuity guff in there and the story ends too abruptly, but it’s still a fun Leatherhead tale that eventually kicked off a pretty good story arc that ran in Tales of the TMNT (Vol. 2). I’d recommend it. This was one of the first few issues of the Mirage comics I read. It really perked my appetite for more! Certainly one of my all-time favorite issues and I love Berger's art. i had a question why do you skip from vol 1#8 to vol 1#45 ?